I’m going to do a review of phrases. There’s absolutely no point in teaching people how to punctuate the things correctly if they don’t know what they are. Honestly, before I researched this thing, I couldn’t have told you what an appositive phrase was, and your eye tends to just glide over something you don’t understand. Prepositional phrases are probably the most familiar. A prepositional phrase starts with a preposition (I know–big surprise). It indicates location, either in the physical world or in time. The following list of prepositions is from Grammar Bytes: http://www.chompchomp.com/terms/preposition.htm. A caution is given for the word but. But is usually a conjunction. However, but is a preposition when you can substitute the word except. Example: Everyone but the dog ate hamburgers. A prepositional phrase generally answers one of the following questions: Which one? How? When? Where? If a prepositional phrase starts the sentence and is longer than four words, use a comma. After their journey across Mordor, Frodo couldn’t bear to drop the Ring into the fire. Beyond the terrible tunnel through Shelob’s lair, the orcs of Cirith Ungol lay in wait. Without the steadfast help of Sam, Frodo would have never made it through. If a single prepositional phrase is four words or less, don’t use a comma. After their journey Frodo couldn’t bear to lose the Ring. Beyond the terrible tunnel the orcs of Cirith Ungol lay in wait. Without Sam’s help Frodo never would have made it through. If you use more than one prepositional phrase consecutively, use a comma in between if the phrases are a series. A series is like a list. Everything has equal weight, and it all modifies the clause (complete sentence) that follows. Over hill, over dale, we hit the dusty trail. Under the bed, behind the couch, in the bathroom–I’ve looked everywhere for my keys. If one of the prepositional phrases modifies the other, then they aren’t both modifying the phrase that follows. No comma between them. If this makes your head spin, there’s an easy solution. Don’t use more than one prepositional phrase at a time. Then you just have to count words. These are actually easy to explain. According to Grammar Bytes (http://www.chompchomp.com/terms/appositive.htm), an appositive phrase modifies the noun right next to it. 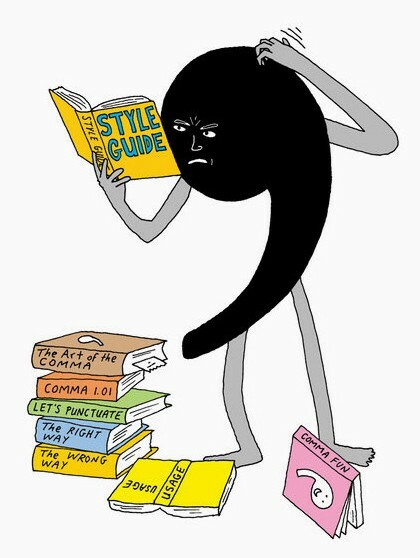 When you begin the sentence with an appositve phrase, use a comma. A dwarf with a burning desire to regain his homeland, Thorin was easy to convince to return to the Lonely Mountain. An elf-lord with a great store of knowledge, Elrond was a logical choice to consult about the journey. A Took as well as a Baggins, Bilbo finally agreed to become the fourteenth member of the company. I hope you enjoyed how easy the last one was because these get tricky. On the surface, it’s not that hard. Use a comma after an introductory participial phrase. A participial phrase begins with a participle. And what is a participle? I’m so glad you asked. A participle is a verb that ends in ing (present tense) or ed (past tense), as well as the alternate endings for irregular verbs. A participial phrase acts as an adjective–it modifies a noun. Grieving for Ben, Luke was determined to destroy the Death Star. Stuck behind the back of the dresser mirror, the treasure map was easy to overlook. Drawn on the sidewalk with chalk, the secret code was obliterated in the rain. Drunk on poetry rather than alcohol, Jorge bumped into Megan and still looked like a fool. Running flat-out, I managed to make the bus on time. However, when a participial phrase comes directly after the noun it modifies, you don’t need a comma. Ugh. Unless the statement is the sort that would go in parentheses (See Commas and Parenthetical Statements). I hate the pause test because it so often fails, but it seems to be the best one for determining commas in this case. The treasure map stuck behind the dresser was easy to overlook. The secret code chalked on the sidewalk was obliterated in the rain. The face looking back from the mirror was that of a fool. But if the participial phrase is not directly after the noun it modifies, it gets a comma. The treasure map was easy to overlook, stuck behind the back of the dresser mirror. I managed to make the bus on time, running flat-out. The face was that of a fool, looking back from the mirror at him. Participles that end in ing are probably the most common, and herein lies one of the perils of using them. Participle phrases are easily confused with gerund phrases, because gerund phrases also end in ing. But gerund phrases replace a noun, rather than merely modifying it. Gerund phrases DO NOT get commas. Grieving for Ben was a necessity. Running flat-out was the only way to make the bus on time. Looking into the mirror was a mistake. Sticking the treasure map to the back of the dresser mirror was the smartest thing I ever did. The other common problem with participial phrases is the noun they modify must be the closest one. If another noun comes between them, you have a misplaced modifier. Shining in the sunlight, Bilbo thought Sting was a marvelous sword. Shining in the sunlight modifies Bilbo, and it should really modify Sting. Running for the bus, it pulled away just as I got there. Running for the bus describes I, not the bus. Jorge bumped into Megan, drunk on poetry rather than alcohol, and still looked like a fool. Most people will probably get the intended sense from this sentence, but it technically means that Megan was drunk on poetry. Don’t introduce unnecessary ambiguity into your sentences. An infinitive phrase is a verb that starts with the word to, followed by a simple form of a verb. An infinitive phrase can act as a noun. In that case it does NOT get a comma, even if it starts the sentence. To write full-time is the dream of almost every writer. To drop the Ring into the fire was Frodo’s goal. To escape from her abusive home was imperative. Infinitive phrases can also modify the clause (sentence) that follows. Then it’s an introductory phrase, and it gets a comma. To keep the dog from chewing yet another remote, Harry kept it on top of the counter. To make it easier to bring the groceries in, Lupe parked right next to the house. To use commas correctly, you’re going to have to learn the rules. An absolute phrase combines a noun and a participle (see above), and it modifies the clause that follows it. Always use a comma when beginning a sentence with an absolute phrase. His back breaking, the slave had no choice but to continue his cruel labors. Arms crossed, she wasn’t a hopeful candidate for a date. Her fingernails scraping the last bits of food from the bottom of the bag, she hoped to stay alive for one more day. The good news is that an absolute phrase gets set off by commas no matter where it is. The slave had no choice to continue his labors, his back breaking. She ran into the police station, her breathing labored and her face flushed. He held the child close, his tears falling as he told her they must pack right away. This was definitely one of my longer, more complicated posts, and I wish that hadn’t been necessary because it’s a lot to take in. But I wanted to be thorough and to explain everything in such a way that you could actually use it later. I hope it was helpful.